Helping to close off Ottawa's expansive 11-day Bluesfest, "Weird Al" Yankovic brought a headlining-sized performance to the 5:30 p.m. timeslot, accommodating the hordes of parents who brought their children out to witness the world's most famous parodist. But it wasn't just families who braved the blistering heat (and a tornado watch), as LeBreton Flats Park packed in thousands of adults and teens weaned on Yankovic's decades-spanning discography. Entering the stage with his trademark accordion, Yankovic and his four-piece band opened the show with "Now That's What I Call Polka!," from his latest album, Mandatory Fun. After a few minutes of videos, featuring Al's appearances (or mentions) on television shows like Tim & Eric Awesome Show, Great Job!, Comedy Bang! 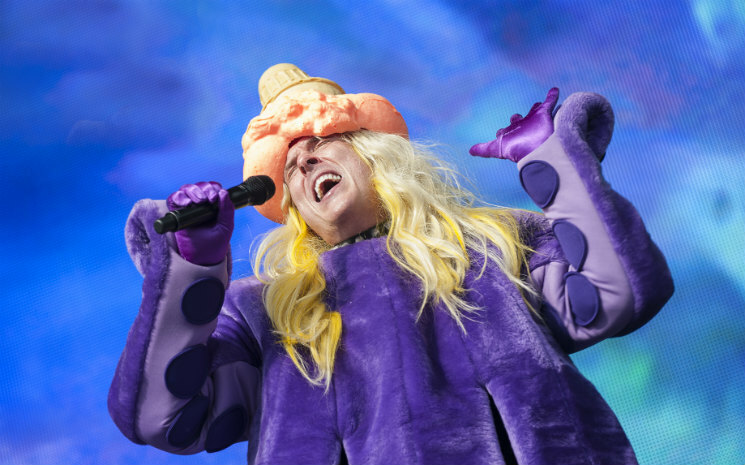 Bang!, The Colbert Report and Adventure Time, Yankovic returned to the stage dressed in an outlandish Lady Gaga-styled costume to play "Perform This Way." Another round of video clips (which would occur between each track) accommodated more costume change for the band, as they returned dressed as Devo to perform 1985's "Dare to Be Stupid." After recreating the videos for "Fat," "Foil" and "Smells Like Nirvana," Yankovic went into a dizzying medley — including "It's All About the Pentiums," "Another One Rides the Bus" and "Canadian Idiot" — that found his crew scrambling around stage to accommodate his on-the-fly costume changes. As a series of chairs were set up near the front of the stage, Yankovic and his band went on to spoof an MTV Unplugged performance, launching into another medley that saw them take on acoustic versions of "Eat It," "I Lost on Jeopardy," "I Love Rocky Road" and "Like a Surgeon." Closing the 90-minute set with the wildly popular "Amish Paradise," Yankovic and his band returned to the stage dressed as Jedi Knights for an encore version of "Yoda" that found the 55-year-old musician looking sweaty, tired and gratified, wrapping up a performance that gave the audience everything they've ever wanted (and expected) from the "Weird Al" experience.